Illumination Vinca Minor is a moderate growing vining plant and groundcover plant that can be grown in USDA Plant Hardiness Zones 4A through 9B. It matures to an average height of 1 inch to 1 foot and an average width of 6 feet to 8 feet, depending on climate and other environmental factors. It prefers growing in a location that provides shade, morning sun with afternoon shade or filtered sun and grows best when planted in loam or clay soil that is well drained or moderately drained. In the spring Illumination Vinca Minor produces blue and lavender flowers. 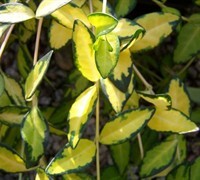 The foliage is yellow, medium green and dark green in color. It attracts visual attention and is resistant to deer, drought, insects, diseases, foot traffic, mildew and heat. Illumination Vinca Minor can be useful in the landscape along woodland borders, in mass plantings, in foundation plantings, in containers or planters, as a border or edger, around decks, swimming pools, and other outdoor living areas, under a shade tree, as a groundcover, between stepping stones and pavers or as a lawn substitute and also in rock or xeriscape gardens, theme gardens, cottage gardens, perennial gardens or shade gardens. Vinca minor 'Illumination' is an evergreen, prostrate, mat-forming plant with long trailing stems that is widely used as a ground cover and container plant. 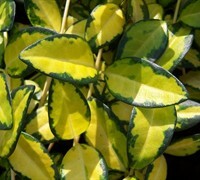 The golden-yellow and green variegated foliage is as attractive during winter as it is in summer. In early spring, the carpet of foliage becomes covered in pretty blue periwinkle flowers. Illumination Periwinkle is easy to grow in the right conditions. It will fill a space faster if grown in organic, moist, well-drained loamy soil, but it will also grow quite well in heavy clay as long as it gets adequate moisture. That being said, it will tolerate periods of dry weather. If the foliage begins to wilt during a long summer drought provide supplemental water. More flowers will be produced if the plants are growing in a spot that provides some morning sun or filtered light during the day. It will tolerate full sun in zones 3 to 6 but requires afternoon shade in zones 7-8. It must have all-day shade in zone 9. Evergreen Periwinkle is great evergreen groundcover in shade gardens because deciduous plants like hosta lily, perennial ferns and others have no trouble popping right through it in spring. The vines are quite aggressive, and will quickly form a dense carpet, but do not climb, cover or choke out other plants in the garden.